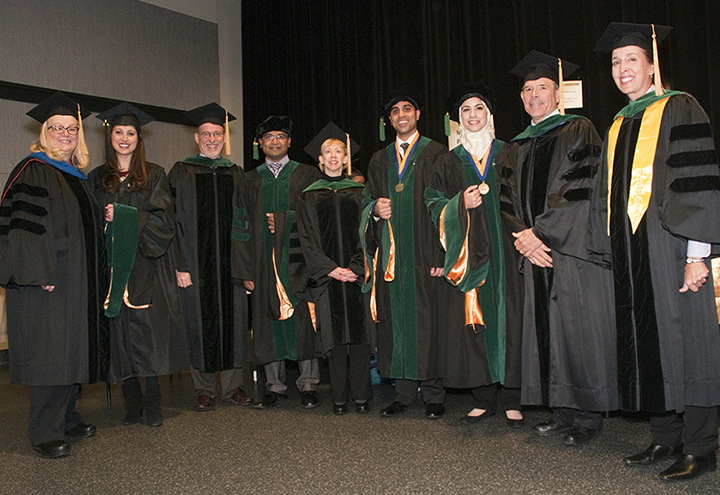 December graduation: Mary Gerkovich, Ph.D., associate research professor; Stephanie Koch, MS Bioinformatics; Richard Butin, M.D., Gold 2 Docent; Anush John, M.D., ’13; Carol Stanford, M.D., Gold 5 Docent; Adil Akthar, M.D., ’13; Mariam Nawas, M.D., ’13; Richard Lustig, M.D., Purple 1 Docent; and Beverly Graves, M.D., adjunct assistant professor of Allied Health. Not pictured: Nivedita Ranjan, M.S. Bioinformatics. Five School of Medicine students — three M.D. candidates and two Master of Science Bioinformatics students — were recognized at the mid-year commencement ceremonies on Friday, Dec. 13, at the Swinney Recreation Center. Those receiving their M.D. degrees were Adil Akthar, Anush John and Mariam Nawas. Stephanie Koch received the Master of Science degrees in bioinformatics. Nivedita Ranjan also received the M.S. Bioinformatics degree but did not participate in the graduation ceremony. 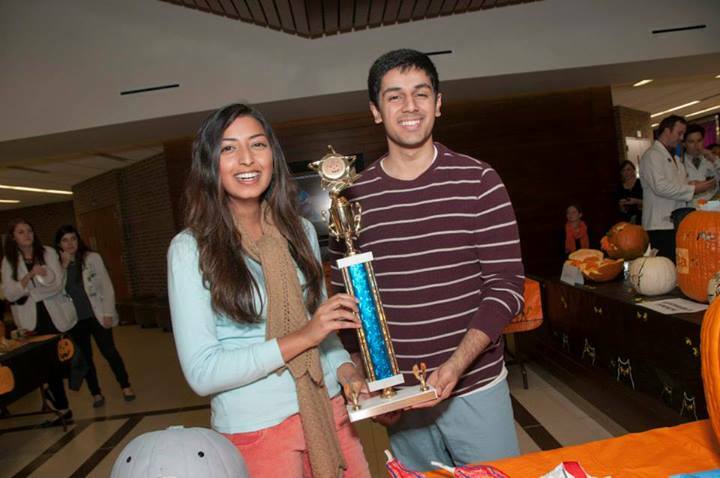 Joan Chandra, MS 4, and Harris Choudhry, MS 4, show off the first prize trophy on Oct. 31 after their Green 8 docent team won this year’s School of Medicine Pumpkin Carving Contest. First place in the School of Medicine’s pumpkin carving contest, that is. 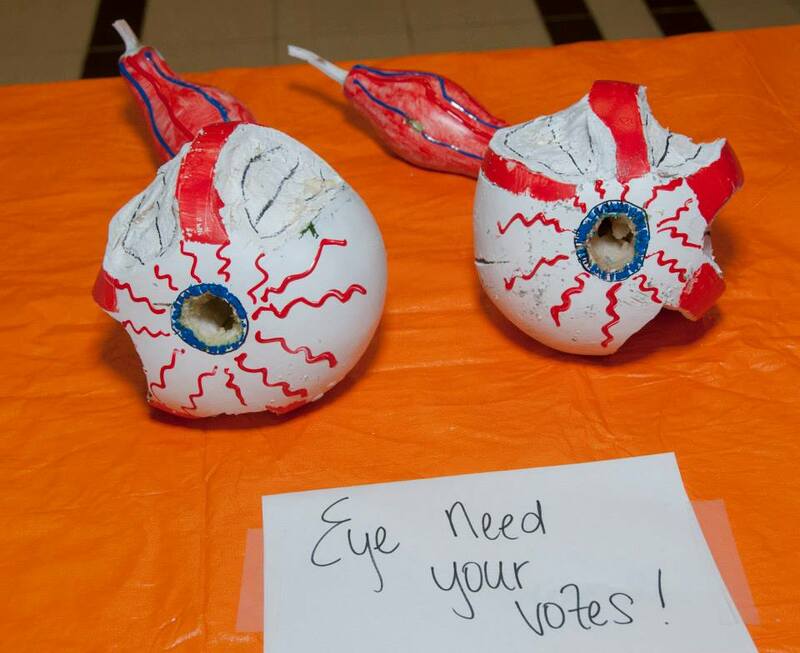 Students from the Green 8 team unveiled this year’s winning entry, a pair of somewhat bloodshot-looking eyeballs crying for support with their name: “Eye Need Your Votes.” School of Medicine staff who cast ballots on the student entries apparently took pity on the pair of eerie orbs over the other seven entries. At the same time, students cast their winning votes in the staff contest for “School Spirit,” crafted by members of the School’s Office of Student Affairs. 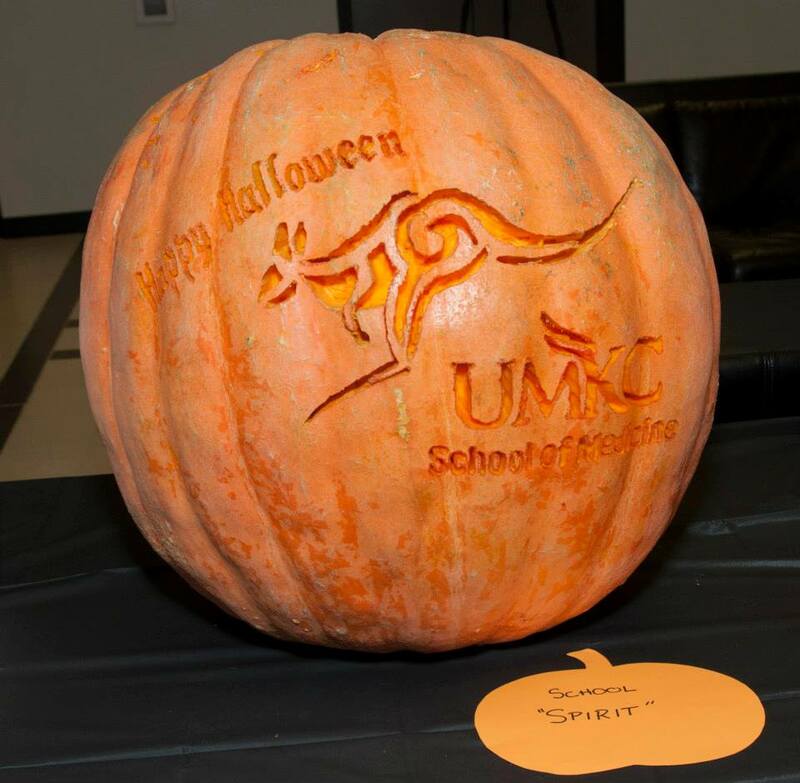 The pumpkin carving contest has become an annual event at the School of Medicine, sponsored by MSAC and the Color Officers. First prize in the student category is a pizza party for the entire color team. Staff winners receive the Gold Stapler and a pumpkin pie. Caroline Doo, Seenu Abraham, Ayesha Murtuza, Ingrid Hsiung, Mitali Thanawala, Huma Mujadad, Jesal Amin, Brooks Kimmis were among the School of Medicine students who took part in the fourth annual Fun and Fitneess Day at the Calvary Community Wellness Center. 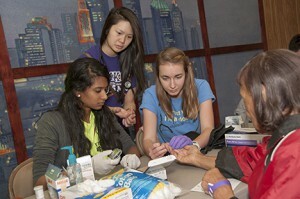 Meghna Singh, Lauren Thai and Rachel Crockett take part in the the health screenings at the annual Fun and Fitness Day. Some were armed with blood pressure cuffs and stethoscopes, others with paint brushes. Thirty-two School of Medicine students joined forces with several local health organizations and the Calvary Community Outreach Network in reaching out to the community for a day of fun and health awareness at the fourth annual Kansas Fun and Fitness Day on Oct. 12 at the Calvary Community Wellness Center. The volunteers provided a wide range of health services including blood pressure, cholesterol, glucose and vision screenings, information on STD awareness and dental hygiene, as well as a nutrition/fitness booth and a first aid booth. Others participated in other fun-filled activities such as face painting. The School of Medicine’s Medical Student Advisory Council (MSAC) coordinated the event in conjunction with the Calvary Community Outreach Network. Volunteers came from the local AMA, APAMSA, KC Free Eye Clinic/Ophthalmology Interest Group, and SNMA organizations as well. The afternoon included carnival activities, rides and games for children, and music by national recording artist Beverly Crawford in addition to the health screenings. School of Medicine faculty, staff, residents and students are invited team up and take part in Step Out: Walk to Stop Diabetes on Sept. 21 to raise money and support the American Diabetes Association. Step Out, which takes place annually at venues across the country, is the signature fundraising walk for the American Diabetes Association, having raised more than $170 million in its 20-year history. More than 120,000 participated in 120 walks throughout the United States last year, raising more than $24 million. This year’s Kansas City walk will take place at Theis Park, located across from Kansas City’s Nelson-Atkins Art Museum. The two-and-a-half mile walk begins at 9 a.m. with registration open at 7:30 a.m.
Local walkers will take a path through Theis Park, along Brush Creek toward the Country Club Plaza, and return to the park. 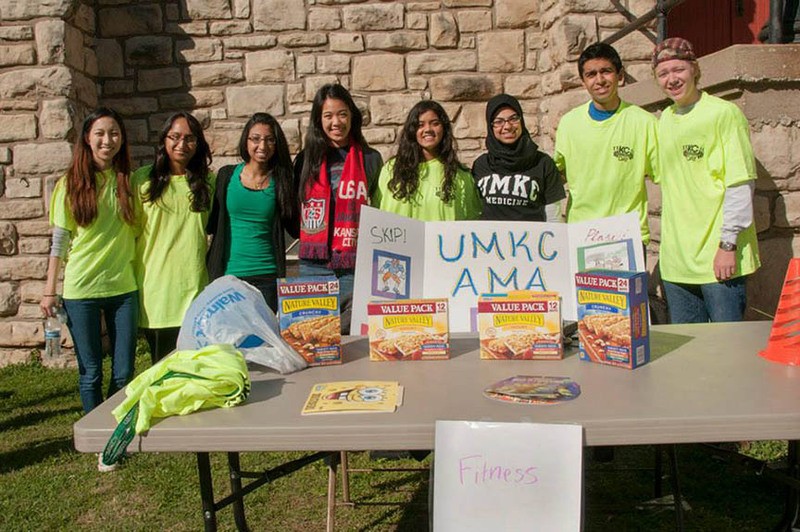 Click on this link for Online registration to join team UMKC SOM, or you can copy and paste the link http://main.diabetes.org/site/TR?team_id=606502&fr_id=9064&pg=team into your Web browser. The School of Medicine team has set a goal to raise $1,000 through this year’s event. For questions, contact Robyn Burky at burkyr@umkc.edu or 235-6017. Family and freinds were busy capturing the moment during the introduction of the Year 1 class at the School of Medicine’s 2013 InDOCtrination Ceremony on Aug. 16 at Pierson Auditorium. A class of 113 first-year medical students took a collective first step toward their medical degrees from the UMKC School of Medicine as they participated in the annual Year 1 InDOCtrination Ceremony on Aug. 16 at Pierson Auditorium on the Volker Campus. The event marks the beginning of the school year and a six-year journey for the Class of 2019. Raymond Cattaneo, M.D., 03, president of the School of Medicine Alumni Association, delivered the keynote address to students, speaking about what lies ahead for them and the significance of the career path they’ve chosen. George Harris, M.D., assistant dean for Years 1 and 2 medicine, introduced the members of the class by their docent units. The class then listened to a reading of the Oath of Physicians, an oath that the class will recite together at their graduation in May 2019. Rahul Maheshwari, MS 2, was recognized as the recipient of this year’sl Richard T. Garcia Memorial Award. The award is presented annually to a Year 2 student who displays outstanding leadership skills, compassion toward his or her fellow students, and outstanding academic performance throughout Year 1. 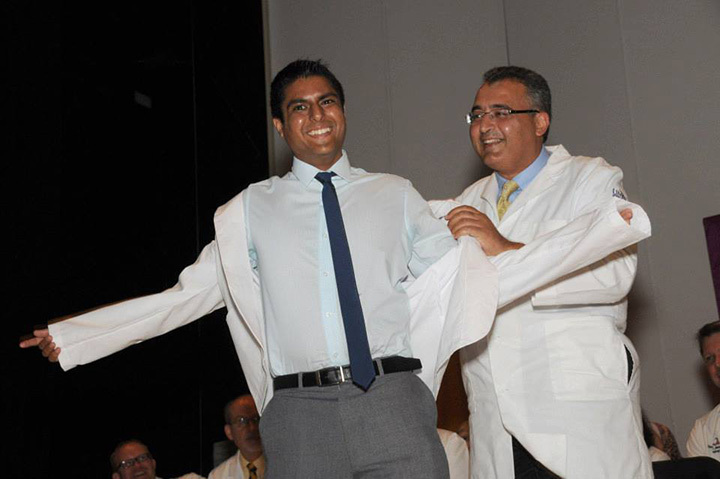 Gold 3 Docent Amgad Masoud, M.D., places the white coat on new Year 3 student, Ankit Mehta, during the School of Medicine’s annual White Coat Ceremony on Aug. 10. Each of 103 new third-year UMKC School of Medicine students received a reminder of the importance of being a physician during the annual White Coat Ceremony on Aug. 10 at the UMKC White Recital Hall on the Volker Campus. 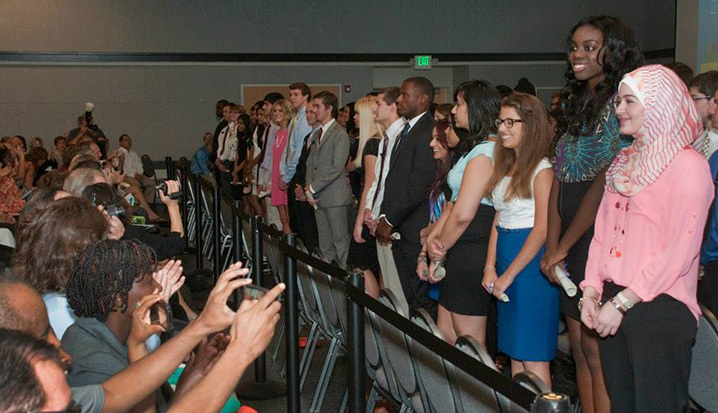 The White Coat Ceremony has been a tradition for students entering their third year of the School of Medicine since 2003. Sponsored by the Arnold P. Gold Foundation, it emphasizes the importance of compassionate care for patients as well as proficiency in the art and science of medicine and marks the beginning of Year 3 training at the School of Medicine as medical students join docent units on Hospital Hill and at Saint Luke’s Hospital. Amgad Masoud, M.D., assistant professor of internal medicine, received the 2013 Outstanding Year I-II Docent Award that is selected each year by students. The School of Medicine’s Career Services Office will sponsor a career fair for all students from 11 a.m. – 2 p.m. on Aug. 17 at the School of Dentistry cafeteria. 2013 Spring Vice Chancellor’s Honor Recipients from the School of Medicine are (left to right) Melony Chakrabarty, MD, ’13, Mena Kerolus, MD, ’13, and Ashika Odhav, MD, ’13. 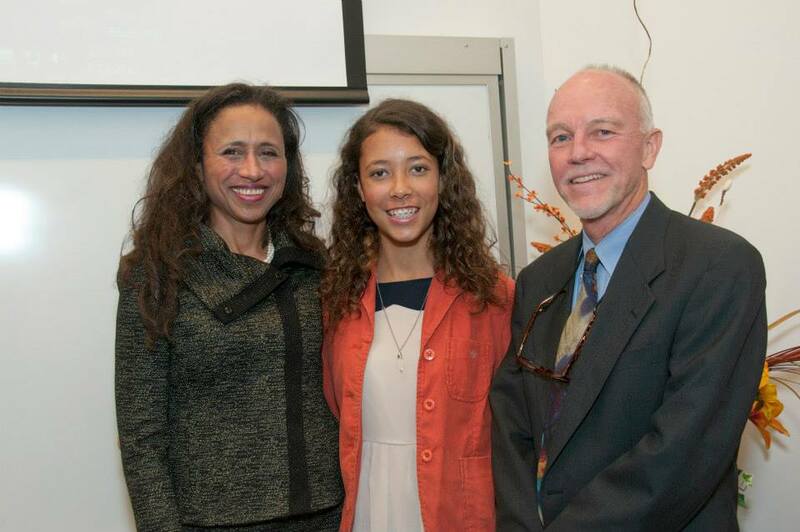 Three students from the School of Medicine were among this year’s graduating students recognized as Spring 2013 UMKC Vice Chancellor’s Honor Recipients for their excellence in both academic achievement and service to the campus community. Melony Chakrabarty, nominated by Connie Beachler; Mena Kerolus, nominated by Agostino Molteni, M.D., Ph.D.; and Ashika Odhav, nominated by Kathy Kinder, M.D., received this year’s Vice Chancellor’s recognition. Students are selected for maintaining high scholastic performace, while actively participating in University and community activities outside the classroom. The Vice Chancellor for Student Affairs and Enrollment Management takes nominations each semester from faculty and staff across the campus for the award. 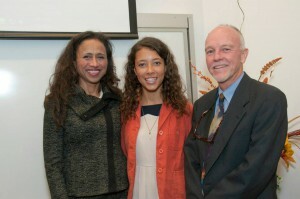 The Honor Recipient program was started in 1975 by Assistant Vice Chancellor for Student Affairs Richard Hoover.